The Lismore Museum archive contains a wide range of items that have been, and still are, important to the story of Lismore. Although less appealing visually, they are of great value to the community and to students of local history. In the years following WW1, there was a drive, across the country, to build village halls for community activities. Many of these were memorials to the men of the village who had not returned. On Lismore, a Public Hall committee was formed, chaired by Alastair MacCormick, the owner of Lismore Stores, who lived next to the shop in Daisybank. When Daisybank was finally sold in 2009, Alastair’s descendants generously gave a wealth of documents to CELM. 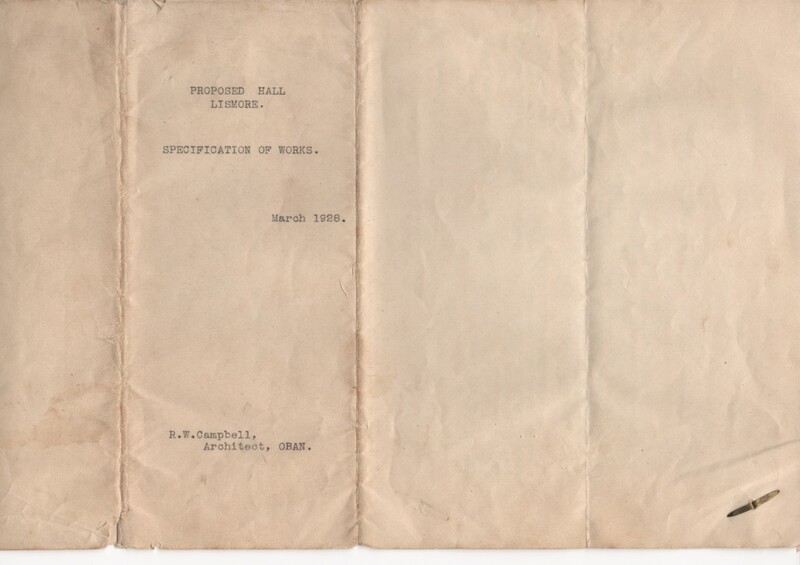 These include a set of 35 documents, mostly letters, from 1928, describing the early struggles to build the first stage of the hall. The transfer of the land from the Duke of Argyll was complete by March 1928 and a specification for the building was drawn up for the committee by R W Campbell, architect in Oban. Estimates were sought and by early May, the contract was awarded to John MacLachlan, Oban, and William MacLeod, Kinlochleven, for £501. This was a substantial amount of money (equivalent to around £30,000 today) and it is likely that the island, like many communities, was supported by the Carnegie Trust – more research is needed on this. So far, things had proceeded briskly but the project soon met a series of obstacles. Delays were caused by difficulties in delivering supplies to the island (a familiar theme? ); disagreements about details of the specification; and technical difficulties with the foundations and soft subsoil. The roofing subcontractors, having delivered slates promptly to the site, were frustrated by the delays. By late 1928, the committee, the architect and the contractor were consulting their respective solicitors to resolve the issues. Frustratingly, the series of letters stops at this point, but we know that work stopped. The Oban Times archive for this period has now been closed to researchers, and it has not yet been possible to find out when the hall was finally opened – but it was probably in early 1930. 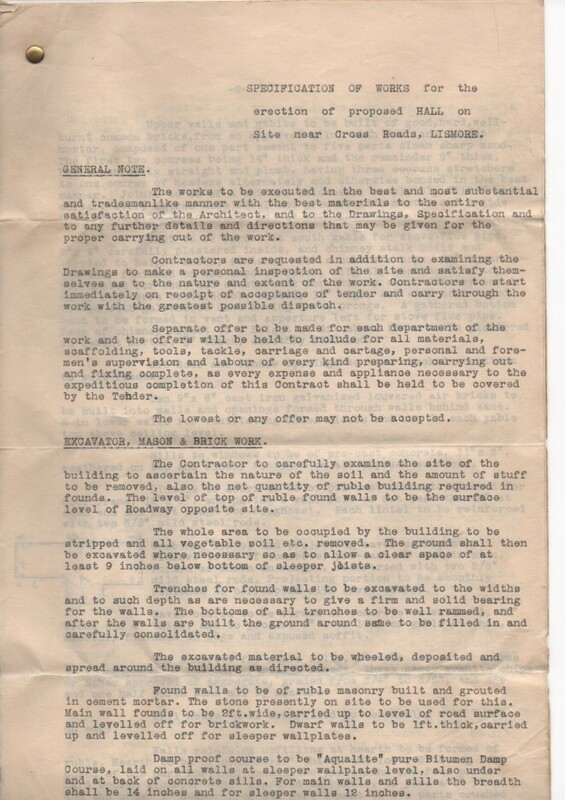 We do not have an image of the first phase of the hall in the archive and we would very much appreciate receiving a copy of any that readers may have. 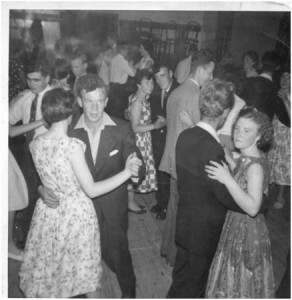 Here is an example of the Lismore community having fun in their hall (1950s? 1960s? Do you remember being there? ).